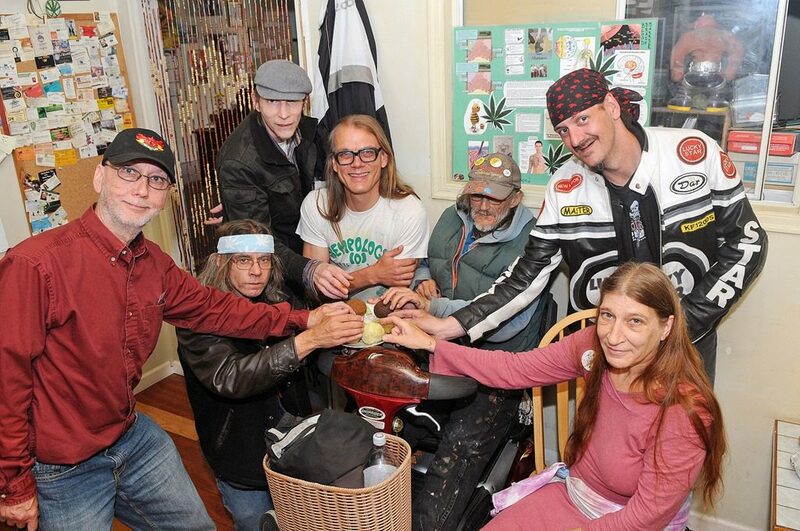 This weekend the Victoria Cannabis Buyers Club will be celebrating 21 incredible years of operating with its Annual General Meeting followed by a potluck at the club. While this has been the club’s most difficult year in many ways, there appears to be a bright future ahead for the organization as we leap into a new, undefined legal future. Several positions are open on the board of directors, giving a few members an opportunity to add their energy to our non-profit society and empowering them to represent us in public. The biggest difficulty faced by the club this year was no doubt the loss of my love, Gayle Quin. She joined the VCBC in 2003 and quickly became a volunteer, sending lots of time in The Box enjoying the company of other members while helping them with their health problems. It was not long before I hired her and in a couple of years we were madly in love, a love that spilled out into the club every day. That magic disappeared when cancer stopped her from coming to work with me, and last fall it took her away forever. At the same time as my love’s health has deteriorated, sales at the club have been falling over the last few years. With around 40 dispensaries in Victoria, new membership signups have dropped significantly and old members are shopping around for the best deals. Some other serious issues the club has dealt with will be addressed to the members at the AGM. Meanwhile, the City of Victoria is in the process of issuing dispensaries business licenses, though the zoning hearings are still many months away. Last fall when the regulations were passed, ironically the same evening my love left us, the council did not allow any on-site consumption, as staff seemed to misled them by suggesting there may be allowances for patient oriented, not-for-profit safe consumption sites. However, when the club was threatened with bylaw fines, we shut the room down until council passed an exemption for us to reopen, something that was a huge relief to many of our members. Now the club has to prepare for the next stage of legalization, as the federal and provincial governments are going to be introducing legislation to legalize cannabis for adults in the near future. Since there does not appear to be much discussion about a separate distribution for patients, it appears that if the VCBC is going to continue operating through these legal changes that it will be given a license to sell to all adults. Whether we wait until we are fully authorized to sell to adults, or begin doing that sooner, will be a point of discussion at the AGM. Regardless of what the future holds for the Victoria Cannabis Buyers Club, there is no doubt that this organization has had a lasting impact on many people’s lives and the community at large. This weekend we will be celebrating our many victories, as well as remembering those we have lost along the way. As we enter into this next phase of the organization and the first stages of legalization, an electric energy is building around the VCBC that has the potential to propel us forward into a unimagined possibilities.